Allegiances may vary between Bernstein�s LSO and NYPO Stravinsky discs � although not in the case of the widely scorned Israel recordings � but I�ve always worked on the more the merrier principle. There are differences of courses in emphases and sharpness of attack between this 1972 Rite and the 1958 New York version. Tempi are broadly similar but not consistently so; sometimes Bernstein speeds up slightly in London but the more intriguing examples are when he is more measured, as for instance in the Ritual of the Ancestors when he�s half a minute slower in London. It points to a slight blunting of his animally magnetic and visceral approach, I think, even though The Games of the Rival Tribes is still convulsive and the Sacrificial Dance still causes one to echo Stravinsky�s famous Wow when he heard the younger Bernstein�s approach. The impression of recession and a slight falling off is heightened by the dodgy old recording set up employed in the studio presumably in emulation of Quadraphonic and Phase 4 experiments, then all the rage. Whilst Stokowski may have been the beneficiary of some sonic spectaculars from around this time (see Cala�s recent retrievals) the same can�t be said of Bernstein�s Rite. The perspectives are still wacky, the percussion still wanders spectrally around, the famed LSO trumpets and �bones seem arbitrarily deposited in the sound-stage and things are either garish or mistily distant. 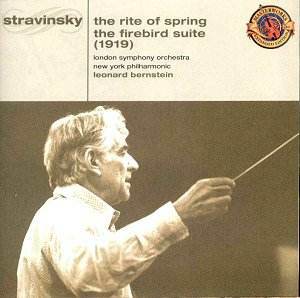 I last saw the NYPO Rite on an Original Sleeve Bernstein box � I�d go for that one. But of course to confuse things we have the famed New York Firebird from 1957 � sounding much more natural in perspective and with the advantage of progressively more sympathetic remastering over the intervening years that�s tamed some of the brightness inherent in the original recording. A must-have. To bring the disc up to almost full capacity we have his Prokofiev Scythian Suite, a driving, purposeful, reading. The sense of incipient tension is set immediately in The Adoration of Veles and Ala � etched rhythm and colour - whilst trumpets and percussion ring out in the culminatory Glorious Departure with commanding verve and Gergiev-like spleen. I�d never really pondered Prokofiev�s influence on John Adams before � but the ghosts of The Chairman Dances are there. Let�s ignore the sticker�s boastful claim that this is a "definitive recording" and rather consider it in the light of Bernstein�s other recordings. Whatever you decide there�s still plenty here to excite, alarm and intoxicate.